The structure of Projects created by the GCD Software is very consistently and logically organized in a hierarchical fashion. In this discussion and hands on demonstration, Philip will walk us through the folder structure and help you better understand what gets created when, where it gets stored, and why. This will be a brief guided discussion and exercise on how to interpret the primary outputs of a change detection analysis. 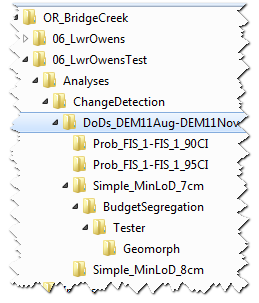 Namely, we will look at Summary.xml output tables, the elevation change distributions and the raster DoDs. Understanding how to navigate the Analyses Folder will help you find your previous results efficiently as well as prevent you from having to redo old analyses.